« Deck the Halls – What Am I Going to Do? The kind of cool thing about everything I’m doing this year – which is pretty much all my décor since I’m doing a whole new theme – is that all in, its costing me less than a $100 dollars to do it all. Between looking to nature and my own home supplies, I think I’m doing pretty good. But we shall see when it is all done and revealed later. As I said, it is really simple. 1. Brush on the glue to the tips of each “leaf” on the pinecone. 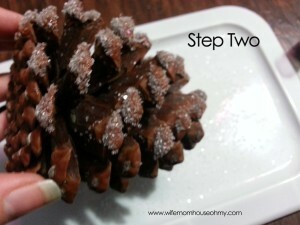 I do one quarter of the pinecone through step 2 and then repeat till complete. 2. 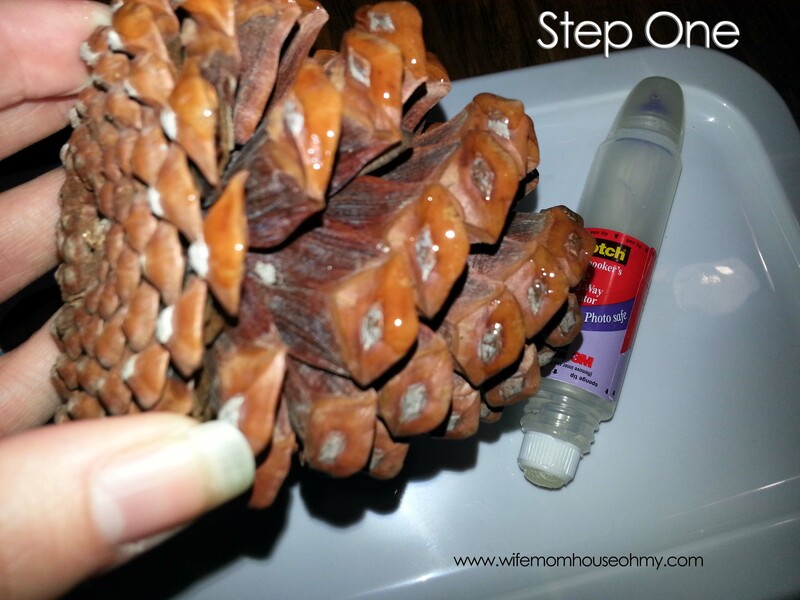 Sprinkle glitter over glue touched areas. Shake of excess. 3. 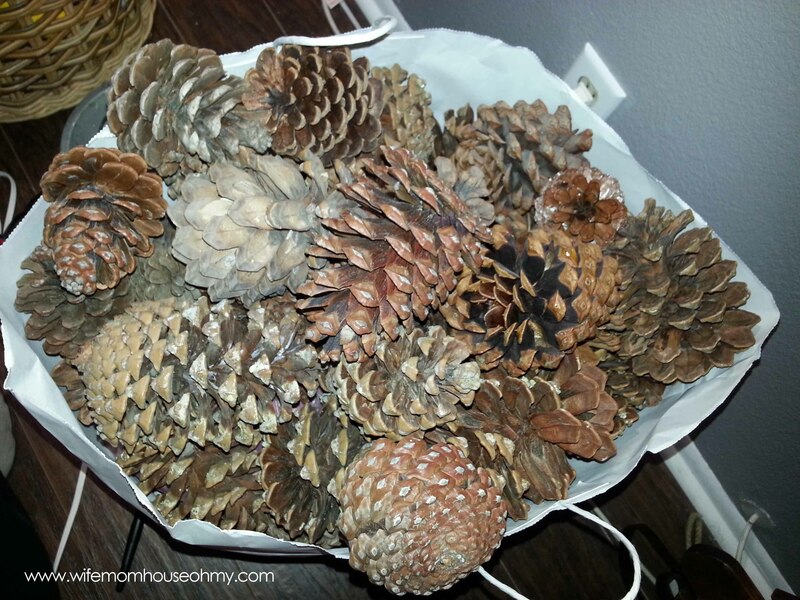 Turn so the pinecone rests on its bottom and let dry. 4. 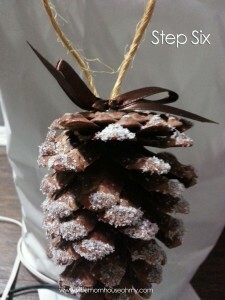 Make a bow with the ribbon while the pinecone dries. 5. Cut some twine that when looped is the length you desire for an ornament hanger. 6. Once the pinecone is dry, in the center of its bottom, put a dab of hot glue and place the ends of the folded twine into the dab of glue to form its hanger. 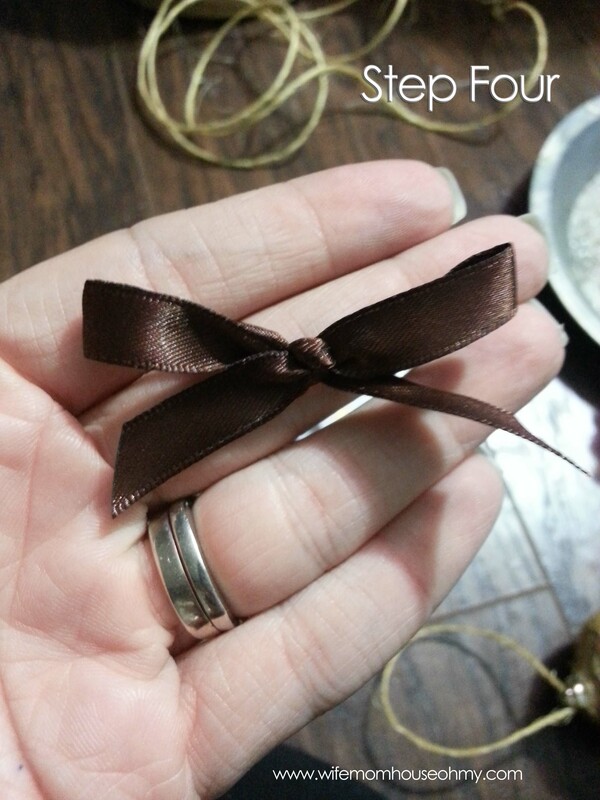 Allow to dry and then add another drop of glue and place the bow. As I said, pretty simple, fairly fast and easily done. I’m going to do some in glitter so the lights can catch them and some without to keep a blend of rustic and elegance. 1. Start by adding hot glue all around the top of the plastic ornament, being sure not to cover up the top of the ornament so you can still hang it. 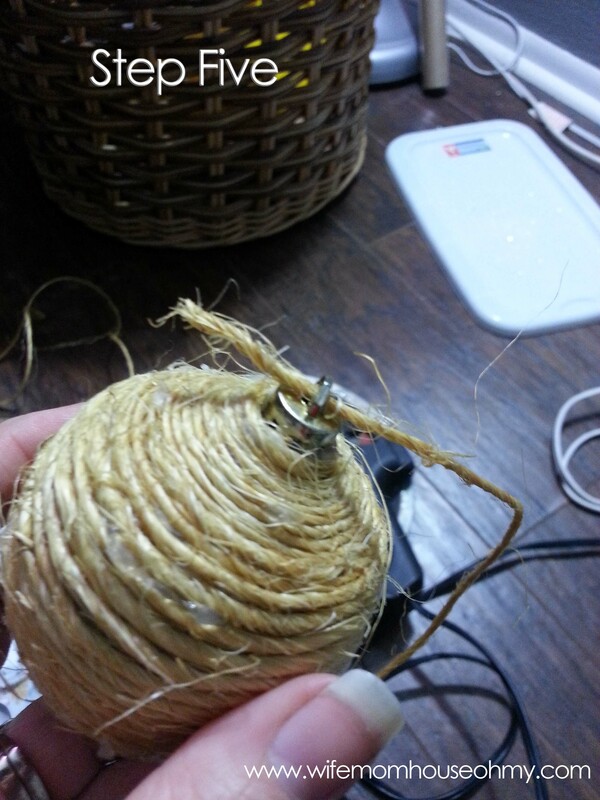 (WARNING: You need to be careful as you will be holding the twine in the hot glue.) 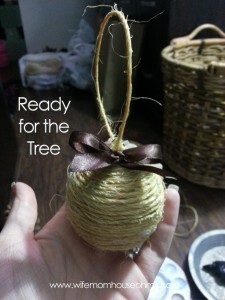 Wrap the twine around the top of the ornament, making sure to hold in place and covering the starting end. I suggest blowing on it to cool it and to dry it faster. 2. 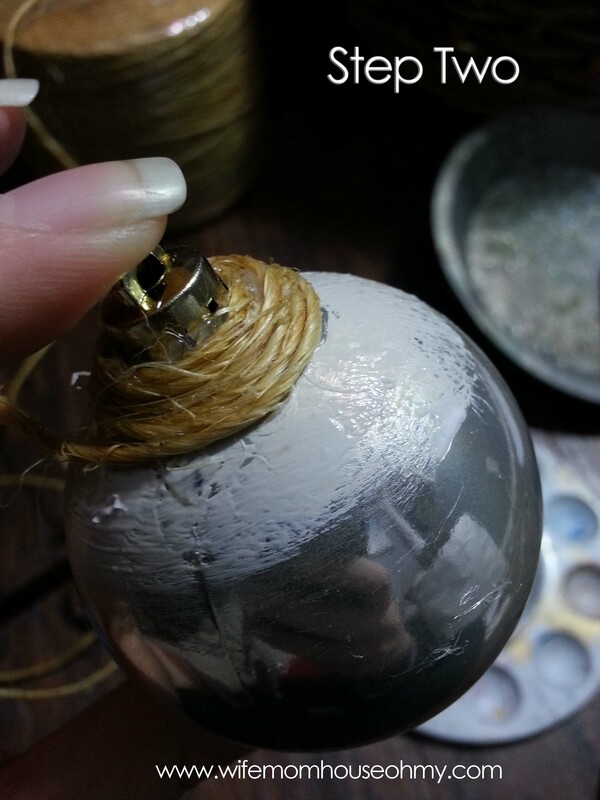 Next brush tacky glue half way down the ornament and begin wrapping the twine around the ball. 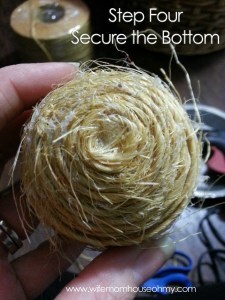 Make sure to press the twine down toward the previous strand so there are no gaps. Also, about every quarter turn add a small drop of hot glue. 3. Repeat step 2 until at the bottom of the ornament. This part will go slow as you will have to continually stop to dry the hot glue to hold the twine in place. 4. 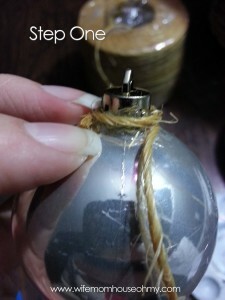 Once fully wrapped, add a drop of hot glue at the end to secure the strand in place. Hold until completely dry. 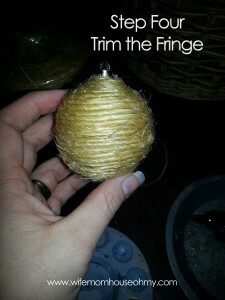 Cute/trim the excess flyaway fringe from the twine. 5. 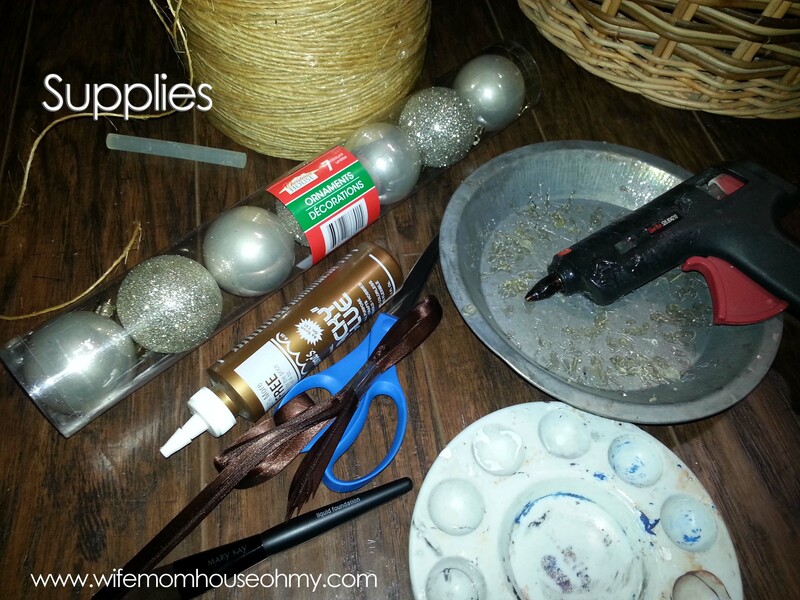 Cut some twine that when looped is the length you desire for an ornament hanger. Feed it through the hole at the top. Fold the twine in half and secure in place with a dab of hot glue on the ends. You will have to hold in place until dry. 6. Make a bow with the ribbon (See Step Four picture above on pinecone tutorial). 7. Add another drop of glue on top of the twine ends and place the bow. Hold in place until dry. Again, pretty simple. 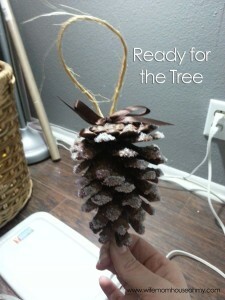 You can leave them plain, play with colors of twine, or add embellishments such as pearls, glitter, pinecone “leaves”, etc.